Steve and Amy Wheeler are the owners of Jed’s. 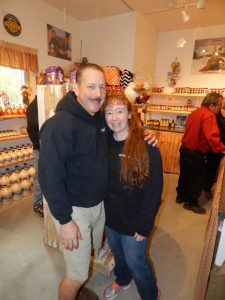 Steve Wheeler and his wife, Amy, have been in the maple sugaring and maple products creation and sales business for 15 years, but the roots to what they do reach much further than that in more ways than one. Their business, Jed’s Maple, is the sweet reward for generations of experience and ingenuity. Steve’s father sugared. Steve’s grandfather sugared. In fact, his great-great-grandfather William Jewett, who built the famed seven covered bridges in Montgomery, sugared too. “It’s a family tradition,” Wheeler said. He remembers his grandmother’s stories of packing the entire family into a horse-drawn sleigh and going to the sugarhouse and making an event of sugaring season days and nights. He loved it so much that he did a project on “reverse osmosis,” a maple sugar-making process, for his high school chemistry class. Although Steve Wheeler was admittedly “bitten by the bug” of maple production, he had a vision when he was young—a vision, he says, that included being successful in a different way than he looks at success now. He wanted to be rich—a professional climbing the ladder of corporations. Indeed, he moved from the area, married his lovely Amy, and both were on that track. Not long after the couple had their first child, though, they took a hard look at their life goals and realized they had changed. Wheeler said, “We wanted to raise our kids where they would be safe. We wanted to be able to spend time with them.” With that in mind, the small family returned to Vermont. 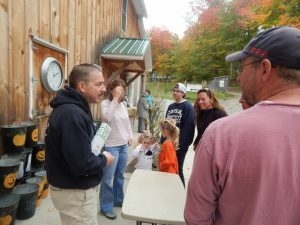 They raised vegetables and their own animals, and Steve began tapping some maple trees on a very small scale—planning only 50 to 60 taps the first year. 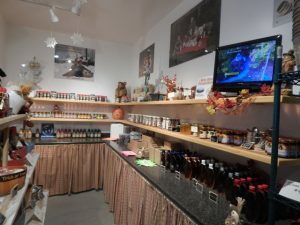 His father, grandfather, and other relatives had always worked the maple sugaring as a side hobby, although at the peak of it his grandfather did have several thousand taps going. “That’s as much as you wanted to do then on your own,” Wheeler laughed. So a hobby is what Steve imagined too. “It was a hobby gone awry,” he smirked. “The first time I put holes in the trees it was magic.” The first year’s taps ended up being closer to 800 instead of 60. He had 1,300 taps the second year. He called upon the family ingenuity and handiness and rebuilt a used evaporator that was in bad shape and turned it into a functional beauty of sorts. He sold out of his first year’s syrup, made more, and continued to have demand as well as the passion for doing what he was doing. Before too long he had 10,000 taps and a thriving full-time business. 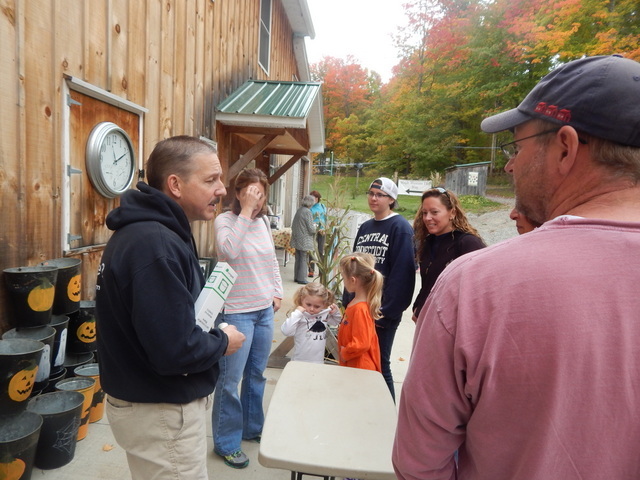 Steve education visitors about the sugaring process and about the products that Jed’s offers. “My children got to hang out with Dad,” he said. They helped—and still do—by packing boxes and going to shows, where they get the opportunity to see new places and visit historic sites, while at the same time, putting on labels or doing other activities they are willing to do and that the family deems safe and appropriate. Family is important to both Steve and Amy—so important that their company, Jed’s Maple, is named after their eldest son. Later on they started a second branch of the business, Jonah’s Maple Supply, selling sugar-making equipment, named after their youngest son. Their products branched from straight maple syrup to a number of other items, and their catalog list is constantly being renewed. Best sellers like maple cotton candy and maple dressings, along with others that perform well, stay on. New products are created and tested each year and those that don’t hold their financial weight in sales are removed from the offerings. “We want to become a destination,” Steve explained. 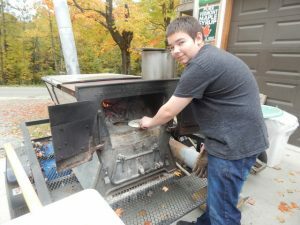 “I want people to be able to see what we do—and to learn how maple sugaring can be done in environmentally friendly ways,” he said, referring to the fact that they boil using used vegetable oil rather than wood or diesel or other fossil fuels, and they recycle the steam from the process back into water again so that there is less energy needed to heat the water since it’s already quite hot coming in as steam. The Wheelers also want to teach visitors about the history of their family business and the history of the land and buildings they use or did use to build the business. They’re in the process of turning one of the older buildings into the Wheeler Family Maple Museum, which they hope will open this spring. The land they use is as rich with maple sugaring history as the Wheeler family itself. They are located in the old Mitchell sugarbush. According to Steve Wheeler, the landowner before Mitchell was a fine wood craftsman who slowly culled the forest of non-maples and used the wood for stepladders, truck bodies, and other products. By the time he was ready to retire, the maple grove was ready for use. W.S. Mitchell then purchased the land from that owner and used it to produce maple syrup. Eventually the land ended up in the Wheelers’ care.